Falconry Equipment from Westweald Falconry. 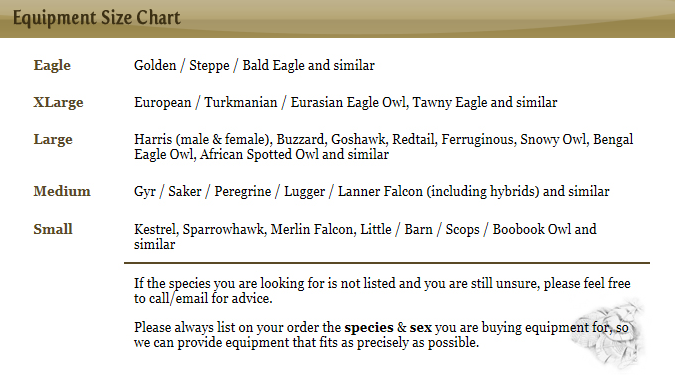 Westweald Falconry offers a simply HUGE range of top quality falconry equipment and falconry supplies at great prices. Supplying falconry equipment to falconers worldwide since 1992.
arrived on the Falconry Equipment scene in 1992. The Westweald Falconry policy has always been to offer consistent high quality, an ever-increasing and ever-changing range, combined with the most competitive prices possible and service that is simply second-to-none. We will not make the same wild claims about our stature that others make, our international standing, how many high profile customers we have or how much better we might be than everybody else. Quite simply we make our statement in the supply of equipment made to the highest standards that we can manufacture or source, and judging by the amazing increase in sales over the years, we're doing pretty well at it! We will not offer you sales goods, discounts, free gifts or other incentives to get your business, or to buy your interest. Our customers come to us over and over again simply because we treat you like.................customers! Our vast stock range has been carefully selected for quality and durability and comes not only from our own workshop but also from many countries throughout the world, thus giving you, the customer, far greater choice. Forgive, if you can, the rantings of some other suppliers who would suggest that any kit other than their own or British made is rubbish. It is not as much rubbish as the statement itself! I trust that you will enjoy perusing our website. Your enquiries are always welcomed should you require further information or help in selecting the correct product. All products (with the exception of DVDs, unless faulty) carry a full money back guarantee if returned within 14 days – a customer care facility that we are pleased to say is rarely used, but is nevertheless in place for your peace of mind. We will always attempt to despatch goods promptly, usually within 24 hours of ordering and often on the same day. Please note: Although we now offer a secure on-line ordering system we are still more than happy to speak with our customers and to take orders over the telephone, by e mail or through the post. And if you are using a Tablet to browse our website from the beginning of November 2015, why not browse our site via our Tablet-Friendly version by tapping the link at the bottom of the page!? Our Mobile-Friendly version will be available very soon too!